Hong Kong's IT job market will see a stable year in 2014. 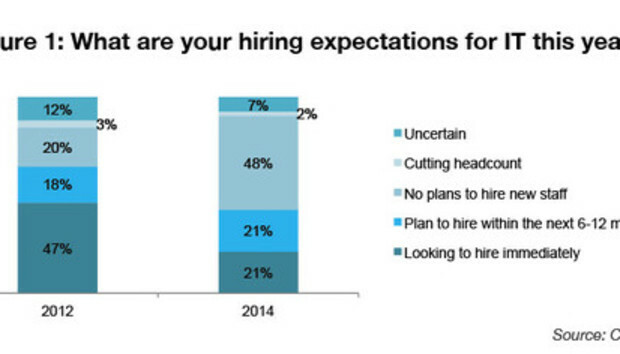 Despite positive business growth expectation, only 21% of Hong Kong IT executives said their firms plan to hire immediately, and 48% have no plans to hire new staff at all in 2014, according to the latest survey by Computerworld Hong Kong and Enterprise Innovation. Although the general IT hiring trend is expected to remain static, the good news is that IT executives are seeing less uncertainty (7%) and expect a slight drop in cutting headcounts (2%) as compared to 2012. In addition, the overall turnover is expected to remain low this year, with only 16% anticipating a higher turnover, while more than half (58%) expect a lower staff turnover. The more stable IT permanent job market contrasts with the IT contracting scene, where more activity is seen, according to Lisa Lam, branch manager of IT contracting recruitment at Manpower. She said more contract employers are looking to hire an entire team rather than a few individuals. "I am receiving requests to hire teams of eight to ten people at the same time," said Lam. "The employers are managed service providers or software vendors seeking contractors to work on their customers' projects." Lam said it is a more positive sign when compared to last year, when only 10% of the hiring was to fill new headcounts and 90% were replacements. She added the most sought-after roles are application specialists--particularly SAP and Oracle experts. Application specialists are also popular among IT executives--36% of those surveyed stated they anticipate a need for these workers. The percentage increased from 2012, when 29% expressed a need for application specialists (Figure 2: scroll down to the photo album to see the chart). Cloud computing skills are also in demand. In 2012, many enterprises were still exploring the application of cloud computing, thus only 22% of IT executives stated they needed these skills. But the maturity of cloud computing raised the demand to 38% in 2014--it now ranks third. The top most-needed skills among local IT executives in the survey are mobility (50%), and BI/analytics (45%). Mobility was not listed as an option previously, but increased mobile usage has created opportunities for candidates with experience in mobile applications and management. A rising need to measure and monitor business performance helped drive higher demand for skills in BI and data analytics from two years ago (17%). One skill that declined in demand from 2012 was project management, which dropped from 32% in 2012 to 26% this year. Data center management fell also, from 21% to 14%. Although the government has been trying to boost Hong Kong's regional data center prowess, development has been slow in the past few years. Google's decision to pull out of its data center plan in Hong Kong may also be a contributing factor in the lower stated demand for data center management skills. Nonetheless, the Hays 2014 Q1 Quarterly Report--a guide from the recruitment firm to identify hotspots of recruitment activities--reported that infrastructure project managers remain skills in demand. "At this time of year, turnover will rise and candidates seek their next opportunity. As a result, these professionals will be in high demand to replace departing staff," stated the Hays report. "We will see high demand around the infrastructure space as more projects are deployed." The report also stated that hiring for database administrators is a hotspot, as several multi-national corporations are running large migration projects to unify their databases into a central database, creating demand for skills in this area. According to Lam from Manpower, IT contract roles are becoming more prevalent among both employers and job seekers, bringing a more active recruitment market. Although the survey indicates 40% of local IT executives currently have no contract staff, about one-third (31%) stated more than 10% of its IT team are contractors, with 5% of them having an IT staff of over 50% contractors. Lam added that the top three major IT contract employers in Hong Kong are the government, software and managed service providers, as well as the banking and finance sector. "The government has always hired long term contractors," she said. "But more employers from the banking sector, who used to hire short-term contractors for specific projects, are starting to raise the renewal rate." Many enterprises may not have the headcount to hire full-time permanent IT staff, but projects must still be deployed and maintained, thus moving the hiring expenses under the contracting budget, said Lam. "The renewal rate could be as high as 90-95%," she said. "More employers are also offering contract staff packages and benefits similar to those of their permanent staff." Lam added that job seekers also understand the local IT environment, and many are open to accepting contract roles. "They don't see much difference between contract and permanent roles," said Lam. "Some senior application experts prefer contract arrangements as these employment arrangements allow them to take a three-month break between projects." On the outlook of the local IT recruitment market in 2014, Lam said contracting roles appear to drive more recruitment activities. The latest Hays Quarterly Report also stated more IT service providers are moving their staff directly under its clients' payroll, and: "as a result, demand will rise on the company side, with employers more open to contract candidates."